This is a full episode from the classic 1980s cartoon series entitled "Battlecat" which is episode 96 from series two and originally aired on October 25th 1984. 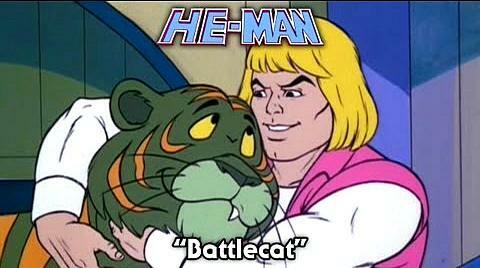 You can watch it legally and for free and it comes from the official He-Man channel. Orco tries to make Cringer braver using a mix of chemicals from the lab, but it backfires. Man-At-Arms gives Orco a warning and then tells the full story of Battlecat. It starts with Prince Adam in his younger days finding the lost tiger cub, Cringer, in the woods. He also explains how the cowardly cat first changed into the fearless Battle Cat and helped He-Man save his friends from danger. Cringer is best described as looking like a green tiger with orange stripes, although he certainly doesn't act like one until he is transformed into Battlecat. He eats too much, sleeps too much and runs away and hides when there is any sign of danger. Nonetheless, is he very loveable in this form! When Prince Adam transforms into He-Man, he fires a beam of energy towards Cringer with his sword, transforming into the mighty Battle Cat.